Veselin Topalov maintains the lead he got in the first day of the Sberbank Rapid Chess Tournament. 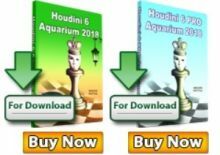 Three players have closed on the Bulgarian; Peter Leko, Sergey Karjakin and Sergei Zhigalko are a mere half point behind the ex-world champion with three rounds to go. Everything is still up for grabs in Kiev. The second playing day began with a direct clash between two of the pre-tournament favorites, Sergey Karjakin had white against Topalov. What could have been a very long struggle finished as a miniature victory for the Russian. In a sharp variation of the French Defense, Topalov seems to have forgotten his preparation or, maybe, he was not able to calculate all the complications over the board. After 13…Qg4, black loses at least an exchange. The Bulgarian gave up on move 21 when he is about to lose even more material. This round also saw the beginning of Sergei Zhigalko‘s ascent to the top. The Belarussian defeated Arkadij Naiditsch with the white pieces in 37 moves. The German put all his confidence in his passed d-pawn, but Zhigalko neutralized it to get a totally winning position thanks to his material advantage. 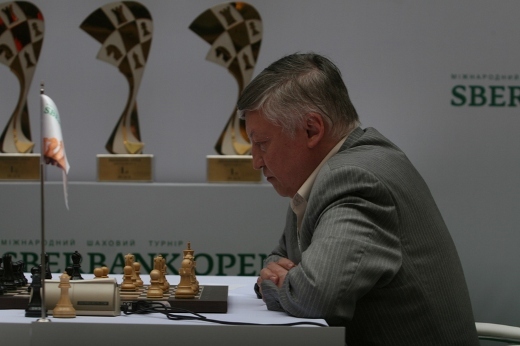 Anatoly Karpov got his first full point in this round. He defeated Pavel Eljanov in 52 moves of a highly strategical battle. The fifth round had three decisive results. All three players that eventually got to share second place won his games. Peter Leko, who is the only undefeated player of the event, defeated Evgeny Tomashevsky. 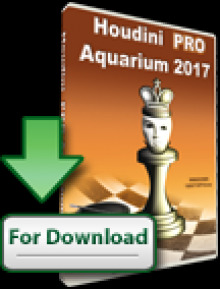 As expected, give the nature of these players’ styles, the struggle was full of maneuvering; neither of them sacrificed the solidity of their pawn structures up until the late middlegame. Leko eventually got a pawn and converted the rook endgame with his usual strong technique. 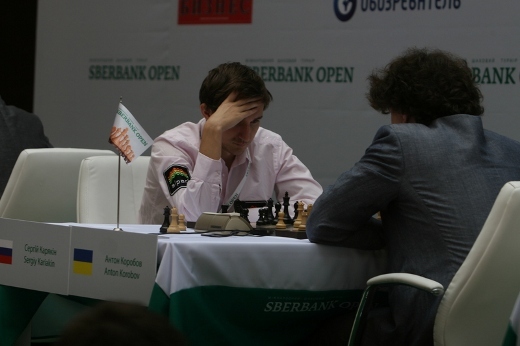 Sergey Karjakin got his second consecutive win against Arkadij Naiditsch. The Russian played the Ruy Lopez with black and used his space advantage on the kingside to grind down the German. 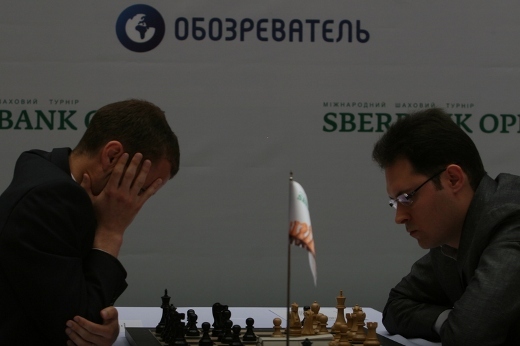 Sergei Zhigalko also had black, and defeated Alexander Areschenko in only 26 moves. 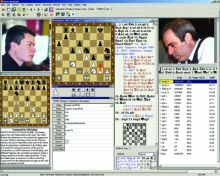 Zhigalko gained the initiative on the queenside in an opposite-sides castling Sicilian. His extremely strong bishop on g6 was a nightmare for white, who decided to resign when mate was inevitable in the next move. Veselin Topalov recovered his sole spot at the top in the last round of the day. He used the Nimzo-Indian Defense to grind down Anton Korobov with the black pieces. The middlegame had opposite-colored bishops on the board, and as the rule dictates, “the player with the initiative will get the upper hand in these situations”. Topalov penetrated his rival’s position and simplified into a totally winning endgame with two connected passed-pawns on the queenside. Peter Leko ended up the day with another win. He played a very nice Ruy Lopez to defeat Pavel Eljanov in 42 moves. Arkadij Naiditsch got his first point of the tournament with a black victory over legendary Anatoly Karpov. Three more rounds will be played today. 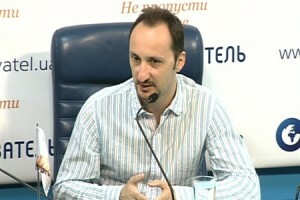 Will Topalov be able to hold on to first place? Let us wait and see.